As a kid my parents had to beg and plead with me to finish my salad. Now, as an adult, I have grown to like them a bit more but I'll admit they're not the first thing I reach for when I want to eat healthier. I no longer have the golden retriever sitting next to me willing to eat any table scrap I offered him. But I do have other secrets for getting my daily dose of greens. One of them is this recipe from my boyfriend's mother. Who knew that adding a pear and some bleu cheese to a typical salad would make me actually request this dish at family get-togethers? Whisk dressing together and pour over greens and pears. Crumble bleu cheese and walnuts over top and serve. Add some chopped grilled chicken breast and you have yourself a full meal! If you know of any other delicious salad recipes that I should try, please send them my way! I'm always looking for new recipes to add to my arsenal! You can also find this post on InWithSkin.com! hmmm sounds delicious and healthy ! yum! 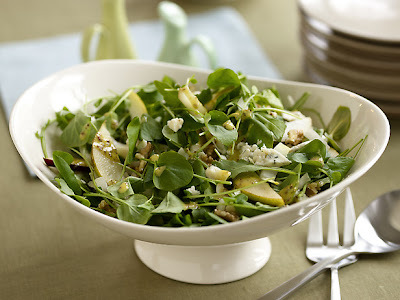 I love blue cheese and pear salads! Nordstrom Bistro makes the best!